BEST KNOWN FOR: Iris Apfel is an American businesswoman, former interior designer, and fashion icon. Born Iris Barrel, she was the only child of Samuel Barrel (born 1897), whose family owned a glass and mirror business, and his Russian-born wife, Sadye (aka Syd), who owned a fashion boutique. She studied art history at New York University and attended art school at the University of Wisconsin. As a young woman Barrel worked for Women’s Wear Daily and for interior designer Elinor Johnson. She also was an assistant to illustrator Robert Goodman. 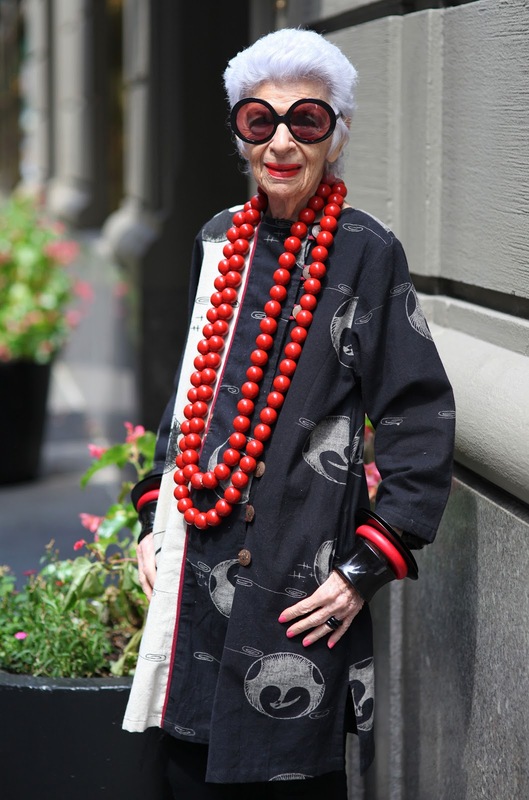 Iris Apfel still consults, and also lectures about style and other fashion topics. In 2005, the Metropolitan Museum of Art in New York City premiered an exhibition about the fashionable style of Iris Apfel entitled Rara Avis (Rare Bird): The Irreverent Iris Apfel. The success of the exhibit was so profound that it planted the seed for traveling versions of the exhibit displayed at the Norton Museum of Art in West Palm Beach; the Nassau County Museum in Nassau County, New York; and the Peabody Essex Museum in Salem, Mass. The Museum of Lifestyle & Fashion History in Boynton Beach is in the conceptual phase of a 93,000 square feet (8,600 m2) new building that will include a dedicated gallery for the clothes, accessories and furnishings of Iris Apfel. Carl and Iris Apfel have supported many charities including a $1.2 million donation to the University of Miami‘s Bascom Palmer Eye Institute.